Want to see your research come to life beyond your desktop screen? Are you eager to meet people who share the same academic interests as you? Do you love to travel? Then attending/presenting at a conference could be perfect for you! 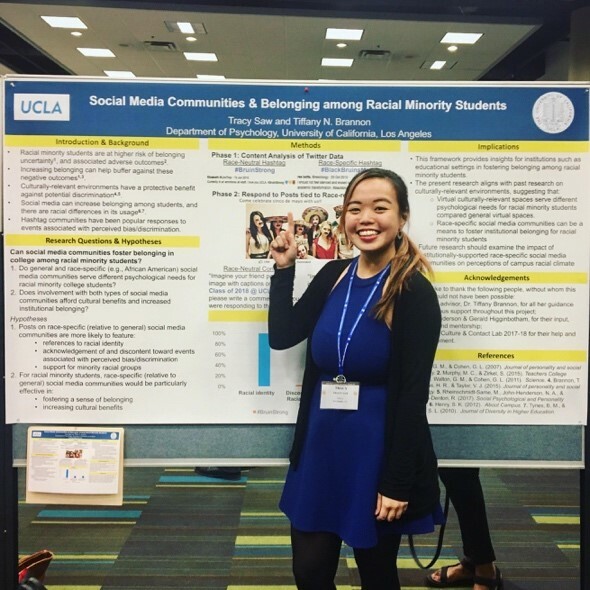 In March of 2018, two of my fellow psychology honors students and I had the opportunity to present our honors projects at the Society of Personality and Social Psychology’s (SPSP) annual conference in Atlanta. Having been a research assistant for Dr. Tiffany Brannon, a UCLA psychology professor, in her Culture & Contact Lab since my sophomore year, I had heard about SPSP every year from Dr. Brannon and her graduate students. I never thought I would get the chance to attend the conference, let alone present a poster at SPSP as an undergraduate. With an incredible amount of support from Dr. Brannon, three of us mustered the courage to apply for the conference. With high hopes and low expectations, we submitted our applications and were eventually all selected to present. With financial support from Dr. Brannon and the Undergraduate Research Center–Humanities, Arts, and Social Sciences travel grant, the cost of attending the conference and staying at the beautiful Hyatt Regency in Atlanta (where the conference was held) were fully covered. The conference was a three-day event, which included talks and several poster sessions. The poster sessions featured around 2000 posters displayed in the exhibit hall over the course of the convention. During each session, attendees walked around to view the different posters, learned about the latest research being conducted across the country and the world, and chatted with the researchers (who typically stood beside their posters) about their work. Attending and presenting at the conference itself was one of the highlights of my undergraduate life. Nonetheless, it was an overwhelming experience, in terms of both preparing for the conference and trying to make the most of our time at the event. As such, I thought I would share highlights of the conference, as well as tips for anyone who might be interested in attending/presenting at a conference as an undergraduate. While the process of creating my poster and rehearsing a cohesive description of my research was nerve-wracking, the 1.5 hours of standing in front of my poster and sharing it with other psychologists (be it undergraduates, graduate students or professors) was really fun and even exhilarating! Not only was it encouraging when people took interest in my research, but the process of answering questions and receiving feedback gave me many ideas on how to better my research question/methods moving forward. It was a great opportunity to practice my public speaking skills while learning how to present my research in a way that can be easily understood by an audience unfamiliar with my research topic. The best part about SPSP was attending the presentations about a plethora of interesting topics. I am very interested in social media research and its psychological implications but have been disappointed by the lack of literature exploring this topic. During the conference, there were two full sessions about social media, and they did not disappoint. My favorite talk was about viral altruism and discussed the rise and fall of the ALS ice bucket challenge. The talk was presented by Dr. Sander van der Linden – a psychologist whose work I’ve been a fan of since hearing about him on NPR and in TED Talks. I even got to talk to him after his presentation and ask him questions about his research. I gained a lot of knowledge that day and inspiration for future research. Even though I love doing research as an undergraduate, the idea of pursuing it for the rest of my life is daunting. I had the misconception that choosing an academic path meant that one had to be a university professor and love teaching. However, SPSP opened my eyes to the different paths research can take you on. In particular, I had a great conversation with someone from the Facebook Research team who took an interest in my work and told me about the world of industry research and the possibility of working for Facebook as a researcher. For example, Facebook has an entire team that studies the formation of disaster relief/support Facebook groups, with the objective of better linking these groups up with the resources they need. It was so cool to see research being used beyond the world of academia.